"Take your nails into the next dimensions with limited edition UV Nail Varnish form the Paranormal collection. Alone, each shade delivers bold, high-impact colour with a distinctive shimmer finish. But when worn under UV light they take on a life of their own, emitting a standout glow that cannot be ignored." 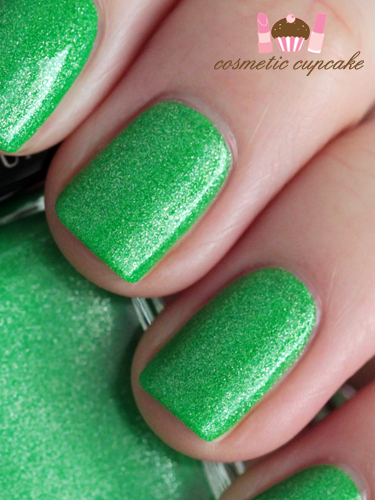 Omen is a gorgeous bright in your face green with shimmer. I FREAKING LOVE IT!!! I don't have enough greens in my collection so I am so crazy happy to add this to my stash. It's bright, bold and fun. Application was beautiful like other Illamasqua polishes and 2 coats is pictured with no top coat. Details: Illamsqua Paranormal polishes are available in four shades from Illamasqua counters in Myer or the Myer online store for $22.50. I love my Illamasqua polishes and I think Omen is definitely one of my faves now! What do you think? 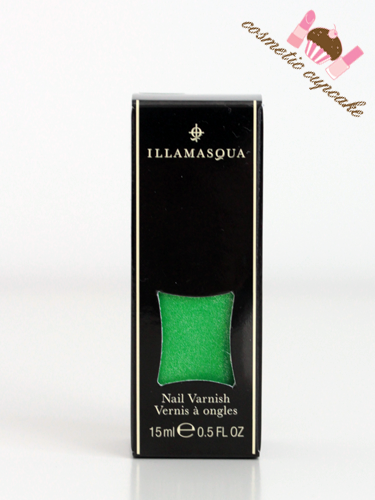 Do you wear green polishes? I know it's not for everyone! Gorgeous colour, I love the shimmer too! Jeez that one heck of green! Yes, yes I love wearing greens. This is so freaking beautiful! I love it! I've never heard of a UV polish before, but it sounds really cool! This is totally awesome! I love green glitter polishes! LOVE. You know this green is made for me. I was so drolling at instagram. I'm wondering if it's LE or if I can pick it up at my next trip haha. But I definately MUST have it. btw the bloom you send me was glowign yellow at the dark light on a concert XD!